Paris Attacks Create A Dilemma For Travelers : Parallels As Paris tries to recover from the terrorist attacks, people who planned to travel there seem to be conflicted about whether to go. Airlines reacted quickly, letting travelers rebook their flights. 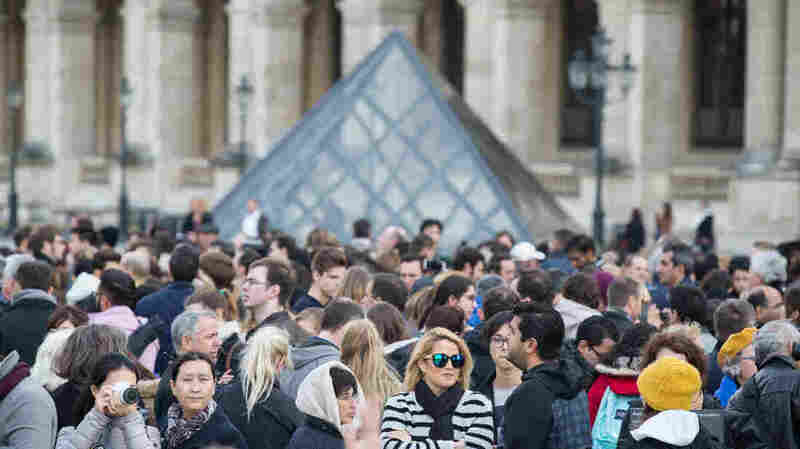 Tourists wait to visit the Louvre as it reopens in Paris on Monday. As the city tries to recover from Friday's attacks, people who planned to travel there seem to be conflicted about whether to go. Julija Svetlova had already made reservations at two Paris restaurants, booked hotels and paid for the two-hour Eurostar train from her home city of London last week when she turned on the television. "I was about to pack my luggage on Friday, and then I just sat down and started to see all the stuff happening in Paris," she says. Svetlova and her boyfriend stayed up until 3 a.m. watching the news. Brokenhearted, they canceled their plans. "I actually went online and I saw that both of the places we were supposed to go to on Saturday, they were just basically half a mile away from [where] all these attacks happened," she says. It's just hard, you know, it's just scary because you kind of think you're not safe anywhere. Svetlova, a photographer who had hoped to visit photo exhibitions in Paris, says she's determined to eventually make the trip. "It's just hard, you know, it's just scary because you kind of think you're not safe anywhere," she says. "[A] family of four canceled a trip that they were going to London, Paris and Barcelona," he says. "Another couple canceled a trip to Provence that they're going to be heading to in December. You've seen some business conferences cancel." Diaz says he was in Paris last weekend, and intends to go again in three weeks. "France, and Paris specifically, is probably one of the ... safest cities in the world right now because of what's happened," Diaz says. "And I think for us it would just do a disservice to cancel a trip in a place where I think they need those visitors and they need that support the most." Rick Seaney, CEO of comparison shopping site FareCompare.com, says he thinks the dip in travel is temporary. He says the typical pattern following a terrorist attack is that travel declines for a few weeks. So far, he says, he hasn't seen traffic, searches or demand change dramatically for Paris or France. "The airlines are waiving ... change fees if you already have a ticket, for example, for just the immediate time period, the next couple of weeks or so," Seaney says. "They're not even waiving the fees if you had travel in December, so if they were worried about that, they'd actually be refunding tickets and canceling flights." The latest Paris attacks come on the heels of other attacks — in Beirut, the downed Russian jet in Egypt, and on the Charlie Hebdo newspaper, also in Paris. Seaney says if demand declines and remains low for more than a few weeks, the airlines' complex ticket-pricing systems will pick up on it. I think for us it would just do a disservice to cancel a trip in a place where I think they need those visitors and they need that support the most. "It may lower those price points as it senses the demand isn't as good," he says. And typically, even in areas where there is real or perceived increased risk, lower prices often bring back travelers. "Even with the security risk, we saw a lot of people traveling to Mexico against the common wisdom to fly down there, because it was a third of the price as it was the year before," Seaney says. Julija Svetlova, the London artist, says she thinks travel and security lines will become more of a hassle. But she will not be putting away her passport because of the terrorist attacks. "I will definitely not stop traveling because of that, because things like that can happen anywhere and you can't predict it," Svetlova says. In the meantime, she's been trying to get through to Eurostar to reschedule her trip. She says every time she calls, though, the line is busy.